Linzagolix choline is a small-molecule, non-peptide, orally active gonadotropin-releasing hormone antagonist (GnRH antagonist). Linzagolix is a gonadotrophin releasing hormone (GnRH) antagonist. 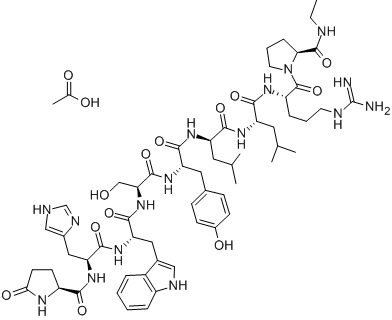 Histrelin acetate is a nonapeptide analog of gonadotropin-releasing hormone (GnRH) with added potency. Fertirelin Acetate is a gonadotropin-releasing hormone (GnRH) agonists that induces estrus in dogs and cats . Nafarelin Acetate is the acetate salt form of nafarelin, a modified synthetic porcine luteinizing hormone (LH)-releasing hormone peptide analog, with gonadotropin-releasing hormone (GnRH) agonist activity. Relugolix is an orally available, non-peptide gonadotropin-releasing hormone (GnRH or luteinizing hormone-releasing hormone (LHRH)) antagonist, with potential antineoplastic activity. 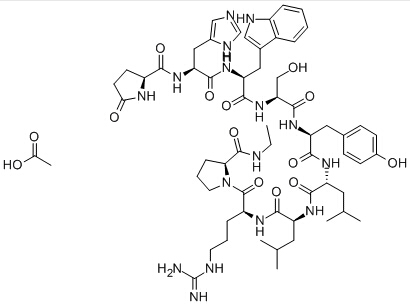 Degarelix is a competitive gonadotropin-releasing hormone receptor (GnRHR) antagonist for the treatment of androgen-dependent advanced prostate cancer. 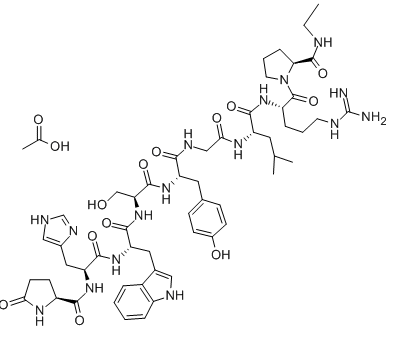 AEZS-108 is a peptide agonist of the gonadotropin releasing hormone-1 receptor (GnRH-1R) that is conjugated to the anthracycline antibiotic doxorubicin with potential antineoplastic activity. Leuprorelin is an agonist at pituitary GnRH receptors. Leuprorelin or leuprolide acetate is a GnRH analog. leuprolide acetate acts as an agonist at pituitary GnRH receptors.